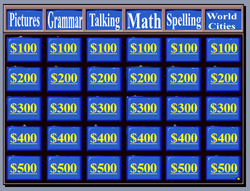 For the entire 5 years I taught ESL in China I played ESL Jeopardy. It's fast, easy and students always want to play. What's more, it really kills that last 10 to 20 minutes of class. 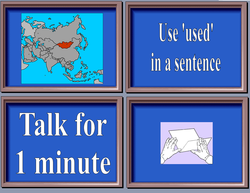 Below you'll find 3 free ESL Jeopardy PowerPoint Games. I used both of these at the EF training center where I worked for 3 years. 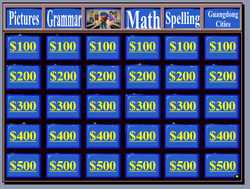 You can read the blog post on Free ESL Jeopardy games to get an idea how to play. If those games work then you can find more games for just $0.99 further down the page. I put all of these together when I was a teacher so I know they work. They're simple, but the hour you'll save in not throwing this all together yourself is well worth the investment! 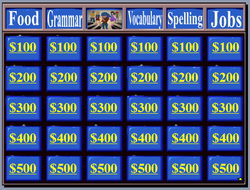 So have fun, get your class together, and play an ESL Jeopardy game today! Download and Try for FREE! Great for those last 20 minutes of class! A distinctive picture is shown, students guess.
? - This last category is unknown, and has weird stuff. World cities, see a picture and name the place. 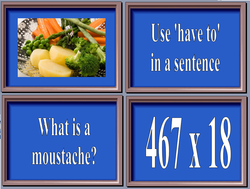 More esl jeopardy games coming soon!